Atherosclerotic renal vascular disease (ARVD) is the most common cause of renal artery stenosis. Endothelial dysfunction is a systemic disorder and a critical element in the pathogenesis of atherosclerotic lesions. Endothelial dysfunction leads to ARVD, and in turn, ARVD exacerbates systemic endothelial function, establishing a vicious circle. 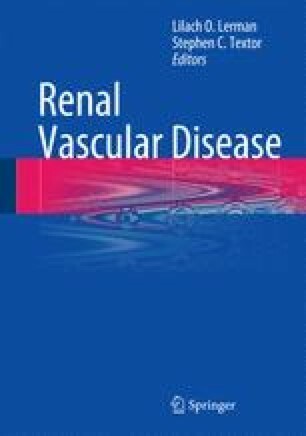 Intravascular ultrasound demonstrates that renal artery plaques have a wide variety of atherosclerotic phenotypes including vulnerable plaque features. The plaque characteristics of the renal artery are associated with the mode of arterial remodeling. With a more detailed understanding of the pathophysiology of the renal atherosclerotic plaque, the treatment strategies for atherosclerotic renal artery disease will continue to develop.